Lip gloss is the primary cosmetic product that every woman has always in hand. It is becoming popular day by day. Lip gloss enhances the natural color of lips and helps us to give finishing touch to the makeup look. A good lip gloss is the must item that women should have in their bags. The mix of different lip gloss colors can help the woman to get mix makeup routine. Your choice of lip gloss can depend on the color, season or the occasion and the most preferred feature is the quality of the item. The variation of colors and several lip gloss's brands in the market can make it hard for customers to find out which is best for each one. It will be easy if you are customers of the known brand but what will do if you are opting for the brand first time. The solution is simple; consider the packaging of lip gloss. Lip gloss is the cosmetic product which most brands considered as a little item and overlook the quality of its packaging. It doesn't matter, how much the product is small or the big; their packaging will always have an influence on the customers. Lip gloss adds charm and beauty to our lips so it is necessary to add charm and beauty to packaging lip gloss also. It makes customers think if the packaging is of high-quality than product will also be good. To add uniqueness and appeal to the lip gloss packaging, custom boxes is the popular choice for brands. Custom lip gloss boxes are perfect to present your product in a distinct way. The packaging tells the customer why you are different from others. Lip Gloss Boxes can be an efficient marketing way to draw in customers. But for this, you should have following features in custom lip gloss boxes. When customers go for buying a specific product in the cosmetic store, there are lots of options available to choose from. The product which has the ability to grab customer's attention tends to sell more. To give your lip gloss item visual appeal and great shelf impact you should add attractive features to the box. Custom lip gloss boxes with eye-catching design can influence customers to know more about the product. So, think about colors, graphics, and tag-lines that can give your lip gloss boxes an attractive look. The primary feature of good packaging is its convenience. Design lip gloss boxes in a way that it should be easy for customers to handle, open and close it. Customers usually have the complaint that it is hard to take out and put the product in the box. 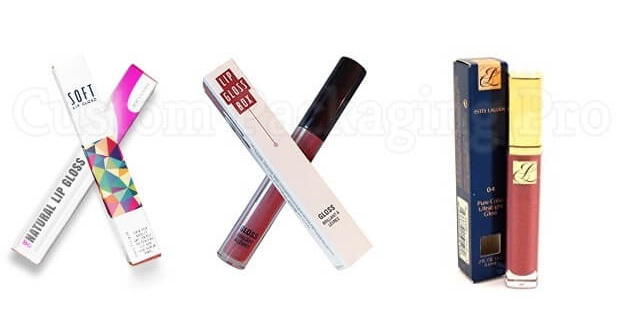 So, it is important to choose the right size and style of lip gloss box according to it. The box should also be convenient to display on retailer's shelf and on women makeup shelf. Custom packaging always the cost-effective solution for all your needs. So, it is necessary for you to keep your packaging cost low. Because if you invest in custom boxes more than your actual production cost then it will eventually result in increased product's price. As a result, it will be difficult for the customer to buy an expensive product. But that does not mean to compromise on quality. You can opt for economical packaging by keeping the lip gloss simple. Simplicity always does the trick. The main purpose of the product is to hold the product safely. There is the chance that product may get damaged or leak during distribution cycle. Use high-quality material for custom lip gloss box to protect the inside product from the outer environment. So, you should use high-quality custom boxes to protect the lip gloss from any risk. A high-quality should not only protect the product but it also prevents box printing from fading out. After all, the box that protects is the perfect custom box. In any business, it is necessary to deliver the right brand message to customers. Your custom lip gloss boxes should give information about the product and brand as well. After picking the product from the shelf, the second thing customers look for is the details about the product. The custom box can also act as a silent salesman or brand ambassador for your product. It can inspire customers to buy the product. So, you should add right information on the right place to communicate with customers. Honesty is the important feature of good package design that most companies don't take into consideration. You should design the box to depict the inside product correctly. Don't over-renovate the box design. The quality of the custom box should match the quality of the box. By showcasing a simple and low-quality product in luxury box, you will end up with disappointing your customers. It will have the negative impact on your sales and brand image. To make your lip gloss noticeable and elegant, Custom Packaging Pro can help you providing design and technical support. We also allow our customers to personalize lip gloss boxes according to your choice.